For many, games are a nostalgic part of their childhood and teenage years. Whether you’re a console purist, a mobile app junkie, or someone who enjoys the get-outside-and-move model of the highly popular, though short-lived Pokemon Go! sensation, video games are a major part of modern life. Below, we’ve put together a Gamer Tattoo Dictionary, spelling out the significance of common gamer tattoo designs. 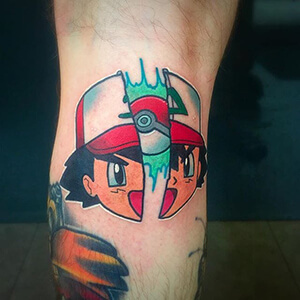 Ash Ketchum: In the world of Pokemon, Ash Ketchum is the main protagonist who has always dreamed of being a Pokemon master. He’s a novice Pokemon trainer who is a protector of Pokemon and very compassionate and kind. Ash’s best friend is a Pokemon named Pikachu, whose special power is to emit static. Green Diamond: Everyone who has played the Sims recognizes the Green Diamond that hovers above one of the sim’s heads. 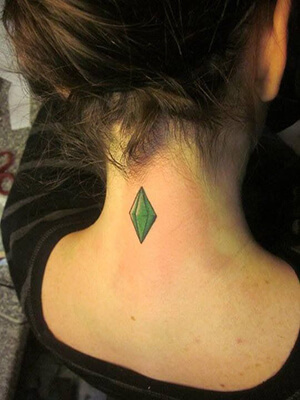 This diamond is a marker of who the player is controlling, and it’s easily the most popular Sims tattoo. Jenova: Jenova, an extraterrestrial enemy in Final Fantasy, is also known to Final Fantasy fans as “Heaven’s Dark Harbinger.” Jenova is recognized for her ability to assimilate herself to other life forms, and she’s also know to take over other life forms by posing as their loved one, as a decoy. 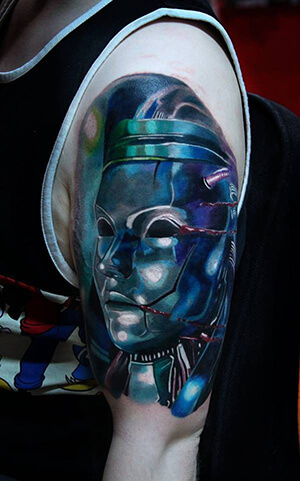 The Jenova tattoo is a popular design with Final Fantasy fans. Hylian Crest: The Hylian Crest is one of many popular Zelda-themed tattoos, and its design is featured above. It represents an archaic bird, known as the ‘Loftwing,’ and it shows up in several important places throughout the virtual world of Zelda. The Loftwing is a symbol of divine protection granted by the Goddess Hylia, and the crest belongs to a magical race of people in the game’s world, called Hylians. These people have pointed ears and remarkable powers inherited from their ancient ancestors. 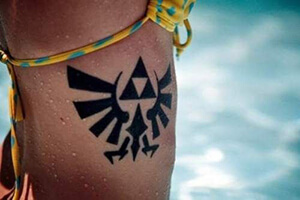 To celebrate the long-living, heroic spirit of the Hylian peoples, these special crests are often featured in tattoos. 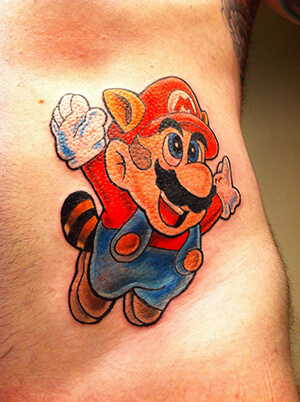 Mario: Mario, a popularly tattooed character from Super Mario Bros, is the main icon of all the Super Mario games, and he’s known for his extraordinary ability to jump. Mario is an Italian-American plumber who is the most versatile of all characters, and he’s well-known as a ‘Jack of all Trades’. Mario’s ability to jump allows him to activate ‘? Blocks,’ mystery boxes that contains coins, super mushrooms, or fire flowers, and ‘P-Switches,’ which can turn enemies into coins or open access to a secret door for a limited amount of time. 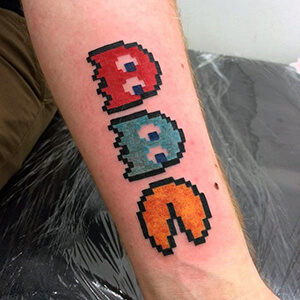 Pac-Man: Pac-Man features a cast of fun characters, and the Pac-Man himself is a very popular tattoo. He looks like a yellow pizza with a slice missing, and he’s a family man with a good appetite and high spirits. A common image is that of the Pac-Man eating a virtual cherry or strawberry. The game also features several well-known ‘Ghost Monsters,’ henchmen who steal power pellets. One popular, evil-doing, genius ghost is named Orson. All of these characters are common tattoos, and they’re often depicted against the backdrop of a convoluted maze. Tetromino: The game Tetris is made up of what are known as Tetrominoes, which are often depicted as tattoo symbols. Tetrominoes are blocks made up of four square components, and they come in a variety of configurations that need to fit with the blocks at the bottom of the screen. The player’s goal is to rotate the tetromino so that it fits properly, in a limited amount of time. 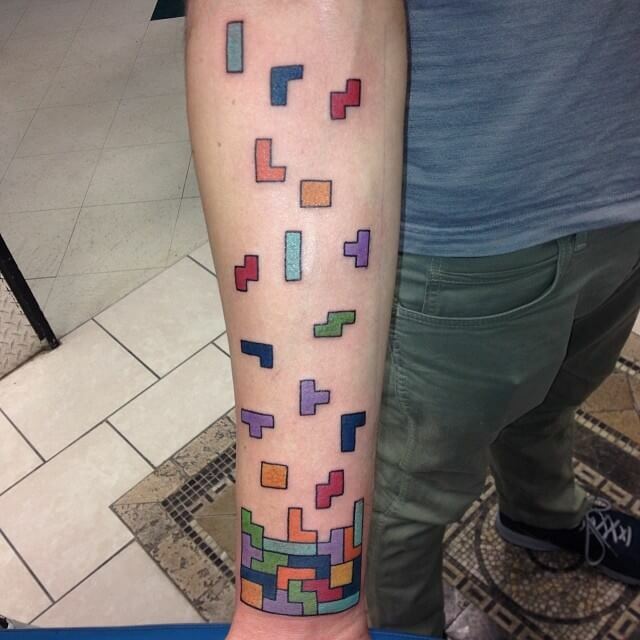 Tetromino tattoos commemorate one’s love for the game. It’s no wonder that we relate so strongly to the world of video games: despite the fantastical elements in virtual universes, many video games have their roots in everyday human experiences. The characters have motivations that closely mirror our own, and the game worlds, though usually based in science fiction, are thematically similar to ours. 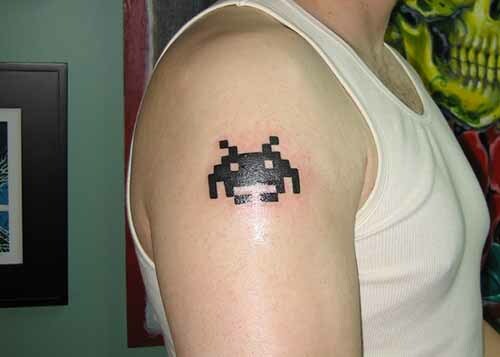 If you know of any other significant gamer tattoos, let us know about them in the comment section below!